Press to get a copy in hqx format for Word 4.0 . Dont't forget to set the page numbers in your software before printing. Murals are the art form that reflect most clearly any changes in the sociopolitical environment. From the time of the Renaissance, murals have laid out in visual form the ideology of their sponsors, be it the Church, the government, a powerful opposition, or simply private patrons. After the Mexican Revolution of 1917, when the new government desired to promulgate its revised version of Mexican history, muralism was revived as a means of visually representing the point of view of "the revolution." Artists were commissioned to adorn public buildings with heroic images of the newly victorious underclass and its cultural history, pre-conquest civilization. In its new role as a tool of historical revisionism and cultural reclamation, murals have accompanied 20th-century anti-colonialist and anti-bourgeois revolutionary movements around the world, though never again with the kind of massive government support that existed in Mexico in the 1920s. Muralism was revived in the United States by the example of three great Mexican muralists: Diego Rivera, José Clemente Orozco, and David Alfaro Siqueiros.1 These three renowned artists came to the United States in the early 1930s when a more conservative government took power in Mexico and reduced its government patronage. During the Depression years, United States artists inspired by the Mexicans persuaded Franklin Delano Roosevelt to begin a mural program as part of the New Deal, but with a few exceptions, the works were unprovocative and unremarkable. Nevertheless, their presence in post offices and public buildings, as well as the Mexican precedent, helped provide the impetus for the community mural movement of the 1960s, which accompanied the strikes, marches, and demonstrations of the Civil Rights and anti-war movements. Unlike all previous mural movements, which were government sponsored, the community murals of the late 1960s began as an arm of struggle--unfunded and unofficial--a way of claiming urban space for a particular group or point of view. From the beginning, a large proportion of the artists were professionals, often young art school graduates from African American and Mexican American backgrounds, or European American New Left activists, using their skills to aid political movements. These trained artists worked with neighborhood residents and youth to create murals and to stimulate self-taught artists to join the mural movement. In the same way that the Chicano movement itself developed in two overlapping directions, one emphasizing cultural identity and the other political action, the imagery of early murals was drawn from both of these sources. Imagery in cultural murals included copies of Mayan murals, pyramids, Olmec sculptures, Indians (historical, mythical, and Hollywood), the tripartite head (Indian, Spanish, and Mestizo), and religious motifs, particularly the Virgin of Guadalupe. Political murals tended to emphasize Mexican history, oppressed workers, portraits of political leaders like Cesar Chavez and Reies Lopez Tijerina, as well as Emiliano Zapata and "Pancho" Villa--heroes of the Mexican revolution. Solidarity figures from other revolutions, like Ché Guevara and Martin Luther King, Jr., were also frequently depicted. At Chicano demonstrations, the UFW flag and the Virgin of Guadalupe were omnipresent as identifying icons. These early murals, filled with political and cultural imagery, were similar in origin and themes to the republican murals of the north of Ireland. Chicano mural painters, however, even from the beginning, placed much more emphasis on artistic quality and complex painting. This was due to the large proportion of professionally trained artists involved in mural making, the importance and popularity of the Mexican mural tradition, and its wide dissemination to those with less skill. For example, the film Walls of Fire, about the murals of Siqueiros, was widely shown during this period, and many murals borrowed heavily from this source. Also, from the early 1970s, some monies were available to pay muralists (or at least buy supplies) through grass-roots fundraising, small grants, and creative use of anti-poverty and social service funds. Another difference between the Irish republican murals and the Chicano walls, even in this early period, was the need of the Chicano movement to address internal problems like gang violence, drugs and other self-destructive behavior attributed to racism and poverty, while at the same time continuing the struggle against external oppressive forces. Muralists approached this issue in several ways. There were impassioned pleas against the constant killings, like "To ace out a home boy from another barrio is to kill La Raza," as well as murals painted by youth gangs to honor the dead and mark a truce. At the same time, there were works glorifying street culture: pachuco and pachuca style, low rider cars, graffiti, Spanglish, and "bad taste," like the use of garish color combinations.3 These works were aimed at raising self-esteem and combating racist stereotypes by glorifying precisely what was condemned by mainstream America. During this early, nationalist period, 1970&endash;75, monocultural groups predominated. Although Chicano muralists from one city would often help out others in big projects, there was little racial mixing during this period. At Chicano Park in San Diego, for example, land underneath the Coronado Bay Bridge was taken by militants for a people's park in 1970. Part of the plan was to muralize the freeway pillars. During the first few years, several freeway offramps, walls, and pillars were painted by local artists and residents and later by artists from Sacramento. But until 1977, all the artists involved in the San Diego project were Latino.4 In Los Angeles, mural projects were organized in two housing projects, Ramona Gardens and Estrada Courts. All of these projects were locally controlled and funded during this period with the assistance of the community arts centers (like Centro Cultural de la Raza in San Diego, or the Mechicano Art Center and Goez Gallery in Los Angeles), which organized these activities. Some of the self-taught artists found the mural medium compatible with their abilities, and felt that their work was of immense value to the local community, which led to their identification as muralists. In 1976, the first national meeting of these self-identified muralists took place in New York City. This sense of identity, of belonging to a larger group, was reinforced by the publication of a newsletter and two books from inside the movement.5 There are some indications that such an incipient identification of wall painters as muralists may also be occurring in Northern Ireland. In his book Drawing Support: Murals in the North of Ireland, Bill Rolston describes the work of one such artist, Gerard Kelly. While spending time in prison as a POW, Kelly studied art and began to paint murals on his release --he is now responsible for a considerable number of outstanding murals in his neighborhood. As Kelly says, ". . . most people like art . . . people would stand and look at a mural before they would read a paper. Also, it gives the people of the immediate area a sense of pride. "6 Such artists tend to continue to paint murals beyond the struggle period and transform a momentary explosion into a continuing people's art movement. When the heat of the Chicano movement (and the New Left opposition in general) began to cool in the mid-1970s, many of the artists who had been involved in militant work began to move towards more personal expressions and reintegrate into the gallery system. Others who had identified as muralists felt the power of their work in the community in terms not only as a call to struggle, but also as fulfilling a need for relevant art in ordinary people's lives that spoke to their pride and their neighborhood. If Irish muralists continue to create community art beyond the peace, perhaps this pattern will be duplicated in Ireland. As muralists moved away from militant imagery (following the general mood of a post-Vietnam society) toward portrayals of self-pride and unity, the nationalist phase of the mural movement ended and the institutional phase began. Murals had become respectable. They were funded by grants from the new National Endowment for the Arts, which had a special program to encourage community arts organizations, city funds, and, briefly but massively, from CETA (Comprehensive Employment Training Act). These latter funds were abruptly terminated with the election of Ronald Reagan in 1980. CETA hired unemployed artists to set up public-service-oriented arts service organizations in cities throughout the country. This general employment program was responsible for a great influx of new artists to the field of community murals. The new mural organizations were multiethnic, and because city funds were often involved, mural content was controlled. More often than not, this was through self-censorship and community requests for noncontroversial subject matter rather than government interference. Positive images of unity, ethnic pride, and history were the most common themes, although whales and other environmental issues formed an important subgroup. 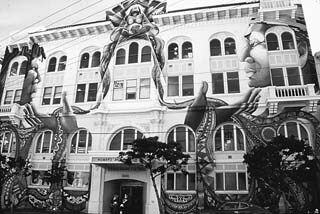 Typical of these new organizations was SPARC (Social and Public Art Resource Center), headed by Chicana muralist Judy Baca, which used public funds along with private grants to finance murals by artists from various ethnic and racial backgrounds. In 1976, Baca and SPARC began a massive project that reflected the new multicultural emphasis. The Great Wall of Los Angeles is devoted to the experience of different ethnic groups in the history of California. It covers more than a half mile of the wall along a concrete flood control channel and, under the supervision of Baca, was painted over five summers by large crews of ethnically and culturally diverse artists and teenagers. Since 1989, SPARC has managed a city-funded mural program, Neighborhood Pride, which has produced six to ten new murals each year in different ethnic communities of Los Angeles. 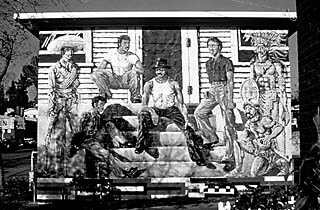 Although community murals had become an accepted art form by the mid-1970s, there was still a significant split between minority, mainly Chicano and black artists, and a more art world-oriented group of "public artists" who were working in abstract and photorealist styles that were being incorporated into "urban renewal" and downtown revitalization projects. By the mid-1980s, with the decline of an activist political base and the introduction of significant funds to public art (as more and more cities passed laws mandating that up to one percent of the costs of new city construction and renovation be spent on art), community muralists began to compete for city projects. This movement out of the neighborhoods and into the mainstream corresponded to the increasing professionalism of muralism, and the desire of artists to have the opportunity to create major and permanent works. In Los Angeles, this process was more successful than in most other cities, helping to make it the "Mural Capital of the World." 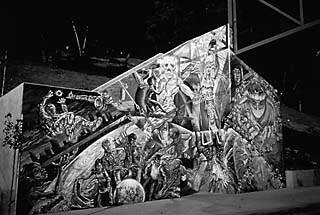 During the 1984 Olympic Games, ten of the established community muralists--Chicano, black, and white--were commissioned to paint murals on downtown freeway walls, thereby bringing the murals to the attention of middle-class residents and visitors from around the world--most of whom would never travel into the neighborhoods where the early masterpieces had been painted. Murals became one of the tourist attractions of the city, a source of "neighborhood pride," and a deterrent to graffiti and gang violence. As such, they continued to receive substantial funds and support, even as the recession of the late 1980s forced cutbacks in cultural funds in many other cities. In the twenty-five years since the heyday of the Chicano movement, the melting pot analogy of American society has given way to a "salad bar-style" celebration of multicultural diversity. Concurrently, the art world has gone from favoring minimalism and hard-edge abstraction to espousing postmodern eclecticism with exhibitions of gender, identity, and politics. The once revolutionary idea that community residents should have some say about the art placed in their neighborhood has become incorporated into the selection process of almost all public art programs. Finally, some community artists are receiving a share of the large commissions that make possible really major works and larger audiences. The trajectory of murals from the barrio to the mainstream is exemplified in the career of the East Los Streetscapers, a group that formed in the early years of the mural movement. In 1973, David Botello painted his first mural, Dreams of Flight, at Estrada Courts, and a year later Wayne Healy (who happens to be half-Irish and half-Mexican) painted Ghosts of the Barrio at Ramona Gardens. The two men joined together in 1975 to form the Streetscapers group, and they continue their collaboration to this day.7 Together, they painted Chicano Time Trip in East L.A. in 1977. All of the above mentioned murals are considered to be classics of the early Chicano movement, presenting a positive message to young people regarding their cultural heritage. Botello and Healy painted new walls almost every year, both in the barrio and in mixed neighborhoods, while holding down other jobs to support their families. In addition to Chicano themes, they created a 500-foot-long space odyssey, Moonscapes, for the Culver City branch of the California Bureau of Motor Vehicles building, and an 80-foot-high mural, El Nuevo Fuego, on the Victor Clothing Company building in downtown, which debuted during the Olympics. In 1990 they founded the Palmetto Gallery, a work and exhibition space for younger artists as well as for themselves. As experienced and respected muralists from the community, they have been able to win a number of art competitions for public commissions in the 1990s, including one for a Metrorail station and another, ironically, for a police training facility. This is a long way from the politically motivated early walls or the calls to struggle of the Irish militants. Is it a contradiction or a progression? The situation certainly contradicts the romantic image of a politically motivated mural movement--something that has not existed for some fifteen years. However, success and professionalism by themselves need not be interpreted as a sellout of the movement, as long as commitment to the community continues. Each work must be judged individually by the integrity of its content, not just by the identity of the patron; after all, Rivera painted some of his greatest murals for major capitalists like Ford and Rockefeller. Moreover, only through more accessible and permanent work that demonstrates a complexity of thematic material and a high level of artistry can a mural phenomenon be transformed into a continuing art movement that has influence for more than a few years. In spite of the mainstreaming of the community mural movement, positive images of ethnic history remain controversial in a changing political climate. The conservative backlash has promoted a growing intolerance for opposing views and multiculturalism, as demonstrated in two recent cases. Recently, objections were raised to a proposed Metrorail station design by Margaret Garcia. The chosen location, near Universal Studios, is also the historical site of Campo de Cahuenga, where General Pico surrendered California to United States forces in 1847. Using text, Mayan symbols, and images, Garcia's design recounts that history and that of Native American and Mexican residents of early California. Objections come from those who feel that this view of history negatively portrays white Americans. The other case concerns more recent history. A mural honoring the memory of the Black Panther Party, by Noni Olabisi, in a black neighborhood of South Central Los Angeles (and originally funded by city money through the SPARC Neighborhood Pride program) was denied permission by the Cultural Affairs Commission after a series of stormy hearings. This mural was painted, but with private rather than public funds. As they walk the thin line between banality and censorship, the muralists of the United States continue on a path toward ever more ambitious artistic expressions on the issues facing different communities today. In Ireland, the republican muralists are now at a crossroads. They may stop painting walls now that peace seems to be at hand--or they may change with the times and, like the community muralists of the United States, convert themselves into a continuing voice of the people.